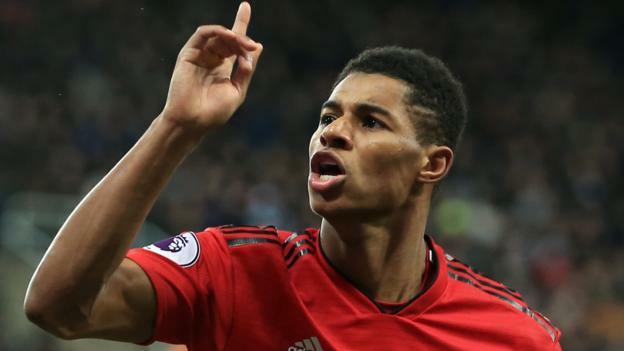 Manchester United interim boss Ole Gunnar Solskjaer says Marcus Rashford can become a “top, top striker” like Tottenham’s England captain Harry Kane. The England team-mates will be on opposite sides at Wembley on Sunday when Spurs look to end Solskjaer’s winning start as Reds boss. United have won all five of Solskjaer’s matches in charge at Old Trafford. “We can talk about Harry Kane and his class. Marcus has the potential to get up there also,” said the Norwegian. Rashford, 21, still has some way to go if he is to match Kane, who is joint top-scorer in the Premier League having already won the Golden Boot twice – but Solskjaer thinks he can make it. “He is very exciting to work with and can become a top, top striker. He’s got frightening pace. He’s become stronger and can hold the ball up for us,” added the former United striker. Rashford has scored seven goals so far this season, placing him fourth on United’s list of highest scorers, behind Romelu Lukaku, Anthony Martial and Paul Pogba. He has been used more often as a central striker since Solskjaer’s arrival though, scoring three times in the 45-year-old’s five matches in charge, compared to the four times he found the net in the previous 22 games under former boss Jose Mourinho.